This 4,000+ sq.ft. 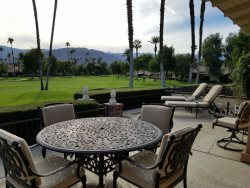 executive home with a private pool is located in south Palm Desert just minutes from El Paseo Drive. A great room with ample seating is perfect for entertaining and two media rooms offer additional big screen TVs as a secondary option of viewing pleasure. The spacious and open floor plan provides easy access to the kitchen, dining room, great room and outdoor patio. Wall to wall sliding glass doors enable you to create indoor/outdoor entertainment for a barbecue and pool party. The beautifully equipped kitchen has ample space for the chefs in your group and the twelve foot dining table offers comfortable seating for up to 12 guests. The backyard offers mountain views and great outdoor entertainment including a secluded, over sized salt water pool and separate spa. A covered patio provides shade and a natural gas barbecue for outdoor cooking and dining. With four bedrooms, a large family or group of eight can stay in this lovely home and enjoy its many amenities. A spacious master suite offers luxurious privacy with a king bed, an adjoining office and en-suite with soaking tub and walk in shower. The 2nd bedroom is actually a smaller master with a king size bed and en-suite. The 3rd and 4th bedrooms are equipped with queen beds. Four bathrooms are decoratively appointed to create that spa touch. The owners are animal lovers and will consider a dog. Please inquire regarding pet policies prior to reserving this property. Free local, U.S. and Canada long distance phone service. Owner requires a minimum of one week rentals during tennis tournament dates in March. Owner also requires a $1,000 security deposit and a non-refundable payment to reserve this property as well as departure cleaning fee. Please call for quote on all fees. Pool or utility fees will apply depending on time of year. Dog Friendly. Please Inquire About Pet Policy and Fee Prior to Reserving Home. Other than the neighbor, we'd stay in the house again any day. Actually, we probably would even with the neighbor. MANAGER'S RESPONSE: We are sorry you had issues with the neighbor. We have informed the owner and hopefully this will no longer be an issue.